This gorgeous handmade dichroic glass necklace is a rainbow of colors with each bead individually handmade and embellished with 4 leaf clover like pieces. 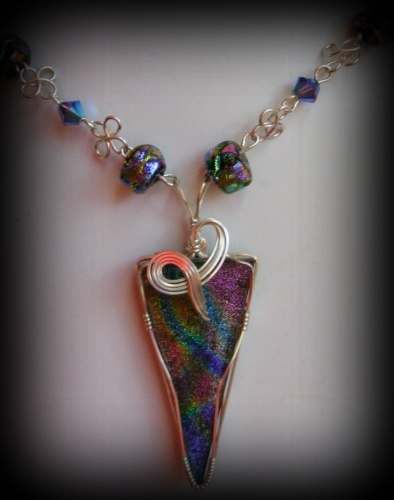 The pendant is a striking dichroic color combination of just about every color you can think of, this should pick up any color you're wearing and make it really dramatic looking. The focal is framed with sterling silver curls - this is truly one of a kind pieces. Measures 19" long.